Siddharth Khullar will be the graduate speaker at the RIT academic convocation and the College of Science graduate delegate. 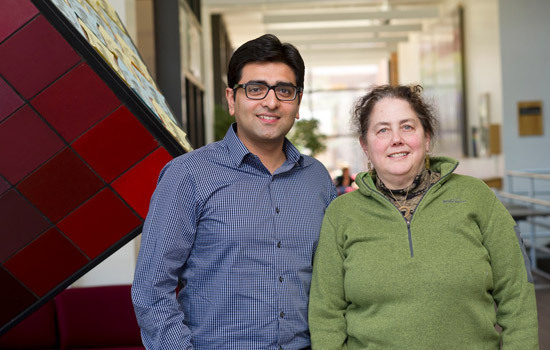 Stefi Baum, director of the Chester F. Carlson Center for Imaging Science, has been a mentor through Khullar’s doctoral studies. Siddharth “Sid” Khullar ’09 (electrical engineering) seldom lets an opportunity pass, especially if it’s bound to push him out of his comfort zone. Khullar, originally from New Delhi, India, embraces the concept of risk as part of an education. Chance and opportunity has led to the Ph.D. he will receive this May from RIT’s Chester F. Carlson Center for Imaging Science. He was named the College of Science graduate delegate and will share his insights as the graduate speaker at the RIT academic convocation. Momentum from a string of positive research experiences has positioned Khullar to stretch his imagination as an employee at one of the world’s most famous corporations. Earlier this year, he knocked on the window of his dream job at Microsoft and the window opened wide. Khullar joined Microsoft’s Computational User Experiences group in January as a post-doctoral researcher. The team applies machine learning, visualization, mobile computing, sensors and devices to advance human-computer interaction, health care, home technologies and computer-assisted creativity. He worked closely with the same group during an internship last summer. “I definitely think my internship at Microsoft helped convince me that this was the place, team and organization I wanted to start my career at,” Khullar says. He first arrived at Microsoft Research in Redmond, Wash., after finishing a fellowship at the Massachusetts Institute of Technology Media Lab. He had joined a select group of graduate student teams at the Media Lab to apply imaging solutions to societal problems. Khullar’s team developed an award-winning mobile imaging device for diagnosing eye diseases. The Media Lab fellowship and the imaging system he helped create impressed the researchers at Microsoft and segued into his internship and introduction to the company. Fast-forward to January and Khullar’s grueling two-day job interview marathon at Microsoft. He gave a presentation to a room full of researchers and stayed sharp through 11 one-on-one interviews with Microsoft scientists and engineers. Khullar continues to take risks. Pursuing projects in unfamiliar domains challenges him to make discoveries and contributions. He is not afraid to explore what some might consider foolish concepts to see where an idea might lead him.